Camera is a bright, orangish pink that’s very summery. It went on really nicely but I did use three coats to make sure it was as opaque as possible, and you can still see a hint of visible nail line in my pictures. Camera was hard to photograph; it’s brighter and pinker in real life. I think the jelly finish makes it fade out a bit in my swatch pictures. It dried fairly shiny, even without topcoat. I compared it to OPI’s Guy Meets Gal-veston from the Texas Collection, which was marketed as a “sorbet” finish but most people agreed just seemed like a jelly. I remembered Guy Meets Gal-veston as a similar color, but when I compared I could see that it’s more pink and a bit more red than Camera, which has some orange to it. In the picture below, Camera is on my index and middle fingers and Guy Meets Gal-veston is on my ring and pinky fingers. Guy Meets Gal-veston is also a lot sheerer. I used three coats of it as well to compare, and I could still clearly see VNL. It also lacks the neon hint and brightness of Camera; it’s a more mellow and juicy pink. 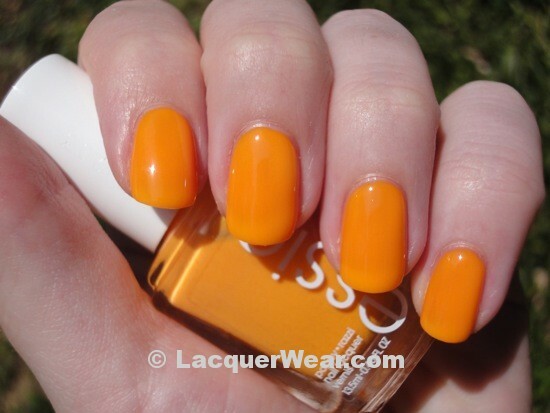 The one polish I was really excited to find from the Poppy Razzi Collection was Action, a sort of mango, yellow-orange. It’s also the slightest bit sheer and has a jelly-ish texture, although it also ended up drying very quickly to a matte finish. I added topcoat for the pictures below to bring out the color, and because I didn’t find it to be attractive as a matte. It went on a bit tricky and took three coats, but I think it’s a pretty unique color. I don’t have anything else like it. While wearing it, it reminded me a lot of egg yolks. It’s a bit funny, but perfect for summer. 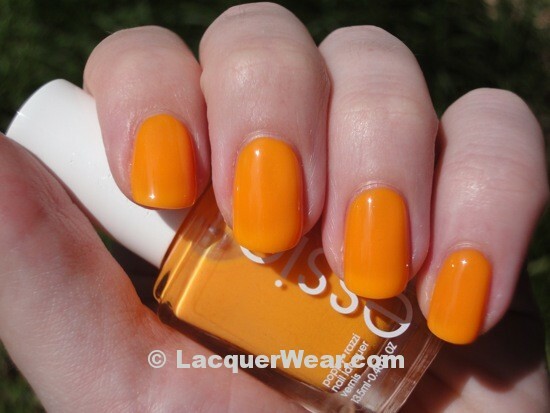 The jelly texture gives it a slightly pillow-y effect and it’s very bright and vivid. I think Action is the star of this small collection – it’s such an odd, light orange. Being a fan of special packaging, I like that these retail bottles actually have the name of the collection printed right on the front label. I don’t think any other Essies have had that type of packaging. It was almost enough to make me buy the other two from the collection as well (a pink and and an orange) but not quite. They seemed similar to other colors I have, and the slightly sheer jelly finish isn’t really my favorite. I do like Camera and especially Action, though, and they’re great colors for summer. I picked mine up at Walgreens. I love this colours! Summer Feeling! Have you tried applying them with a white base coat? This usually wirks very well with neons.